Kelley’s smile will stop you in your tracks! 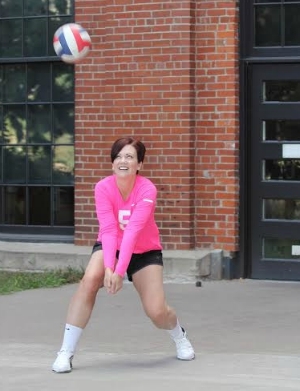 In April of 2015, this beautiful 38-year-old volleyball player and Denver Public School’s OT/PT Manager was diagnosed with liposarcoma in her right leg after noticing a bump behind her knee. After her initial ER visit at Rose Medical Center, Kelley transferred to the Denver Clinic at Presbyterian/St. Luke’s Medical Center where her care was assumed by orthopedic surgeon Dr. Ronald Hugate and oncologist Dr. Ioana Hinshaw. Almost immediately, Kelley underwent surgery to remove the cancerous muscle and 30 post-surgery radiation treatments to kill any remaining cancer cells. On July 29, 2015, Kelley officially finished her radiation treatment! She will still be monitored closely going forward, but now she has more time for her many activities and passions, including playing and coaching volleyball and working toward her Master’s degree in Special Education. She is looking forward to having more time to spend with her family, who greatly supported throughout her journey with cancer. Kelley found a special strength in her mother, Judy, who has been battling breast cancer since October of 2013. She also found great support in her medical team, whom she trusted greatly with difficult choices about her health. 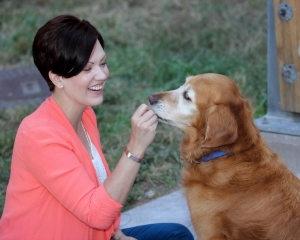 Cancer certainly never slowed Kelley down, and she attributes her positive attitude to choice – the choice to push through and to keep enjoying life. 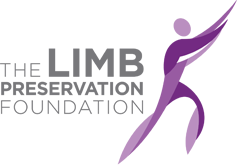 The Limb Preservation Foundation is honored to have supported Kelley in her recovery through the funding of research in the area of limb-preservation. Zoey is a cute and friendly 10-year-old Golden Retriever who was diagnosed with osteosarcoma in May of 2015. After Zoey began to limp one day, her parents decided to take her to the vet where cancer was found in her back right leg. At the time of her photoshoot, Zoey was currently going through chemotherapy – two rounds down and two to go! Though chemo makes Zoey have trouble eating, she has responded very well to the amputation of her back leg. In fact, she hardly seems to notice the difference and was swimming two weeks after her surgery! Talk about a champ!